The Craft in Focus Christmas Contemporary Art Fair at RHS Wisley is on now. Jan has set up our stand and is there on her own to run it. Our stand is just inside the entrance to the fair. 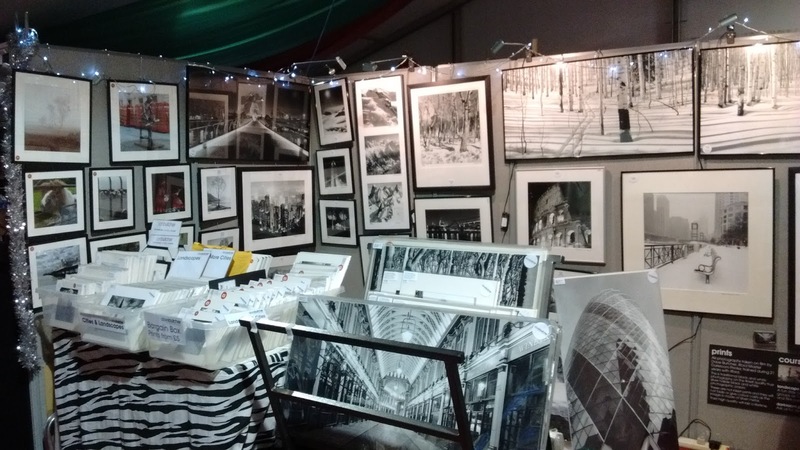 Here’s a photo of the stand to give you an idea of what we have on offer, lots of framed and unframed photographs, both my black and white and Jan’s colour ones. Around 400 prints in all from 20 x 20cm to 100 x 50cm, £5 to £500. There is even a rarity, a limited edition print from me (that’s the £500 print, print 2 from a print run of just 10). My 2 new books, Land Light and Snow Light, are on offer too. There’s copies of City Light and Peak Light too. Details of next years courses are available too, they’re on the website too. Say hi to Jan if you visit! The show opens at 9am every day and runs until Sunday evening.